NASA's space shuttles have used hydrogen fuel cells to get electricity and fresh drinking water in space for decades. So it was appropriate that international reporters covering the last shuttle launch at Kennedy Space Center in Florida could recharge their camera battery packs at a mobile lighting station that runs on pure hydrogen. The power-saving Light Emitting Plasma (LEP) lighting system supplies quiet, zero-emission electrical power, whereas noisy, diesel fueled generators spew greenhouse gases that can produce pollutants, smog and soot. The hydrogen fuel cell-powered lighting system can also simultaneously charge power tools, public address equipment or security metal detectors with its 2.5 kilowatts of extra juice. "This hydrogen fuel cell-powered mobile lighting system has the very real potential to drastically reduce dependence on diesel-fueled mobile lighting across the United States and abroad," said Lennie Klebanoff, LEP project lead at the Sandia National Laboratories in San Francisco, Calif. So far, the system has provided test lighting during the 2010 Academy Awards ceremony, the 2011 Golden Globe Awards, the 2011 Screen Actors Guild Awards and the 2011 Grammy Awards. Aircraft manufacturing giant Boeing, the San Francisco International Airport and Hollywood studio Paramount Pictures also plan to deploy the lighting soon. 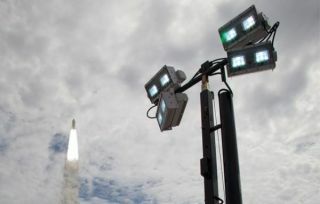 But the site of NASA's final space shuttle launch represents one of the more poignant demonstrations for the lighting technology, given the history of hydrogen fuel cells with the shuttle program. NASA also used the same system for the penultimate space shuttle launch of Endeavor. Just one hydrogen fuel cell-powered lighting system could offset 900 gallons of diesel fuel per year on top of eliminating soot, nitrogen-oxide and carbon-dioxide emissions, according to Sandia researchers. That allows the clean, quiet and efficient system to find use indoors. Funding for the lighting system came from the U.S. Department of Energy's Office of Energy Efficiency and Renewable Energy and Boeing.